If you didn’t get to the amazing Poet Speak, check out the Sandwich Community Television education channel for viewing the event. Hopefully, you will be able to view it on Live Streaming on the website as well if you do not live in Sandwich. I’m on it….and here it is….http://www.sandwichtv.org/….click on live streaming/Performing Arts/Poet Speak. Myracle on Old County Road…. 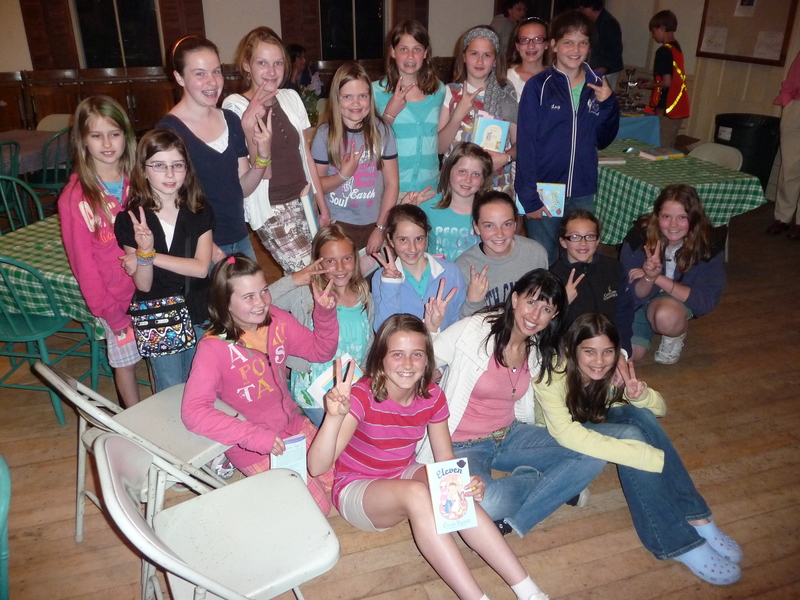 Titcomb’s Bookshop hosted Lauren Myracle – author of the TTYL series, Bliss, Kissing Kate, and the 11 + series – this past Friday night. The article in the Sandwich Broadsider (well-written, I think…) really dwelt on Lauren’s status as….TADA….MOST BANNED AUTHOR! Ahem, Lauren Myracle is definitely a little more than that. The release of her new book, 13+1, gathered daughters, mothers, and even one Dad for the author reading and chat along with a serving of 13+1 sundae toppings & ice cream, cupcakes and a rousing game of ‘Bing Booko’. The cupcakes and toppings are referrals to her book. What’s Lauren like on the tour? Well, she says ‘y’all’ a lot because she’s originally from the South (now living in Colorado). I like that. Listening to the author, what came through is her commitment to finding your ‘true self,’ through the drama, the angst and normal teen thought processes. Some of the scenarios in these books are adapted from her own experiences but they are universal experiences for all of us, I think. Lauren is definitely a person who does not hold back. She is a passionate writer for her characters. I kind of look at the ’11’, ’12’, ’13’ and ’13+1′ books as romance plus every day life in the roller coaster ride of adolescence books. There are parallel maturations going on in her stories: friendships that mutate and mature; boy/girl relationships that are pondered and studied; family relationships that affect the characters. I really like the Sandra (older sister) and Winnie (main character) character studies. I have an older sister and the book made me reflect on that for a few moments. Siblings….that’s a whole ‘nother story. 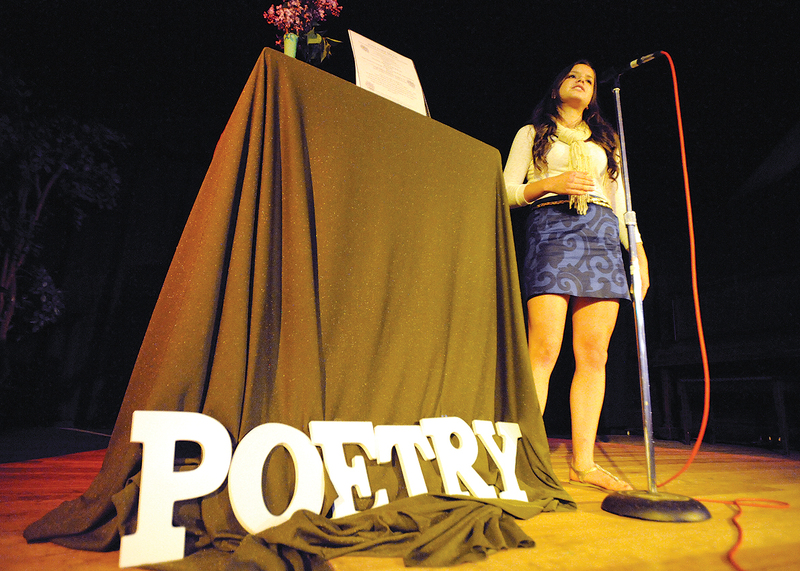 The Grange Hall is a perfect spot for poets and authors, and the evening was rewarding for all, I believe. 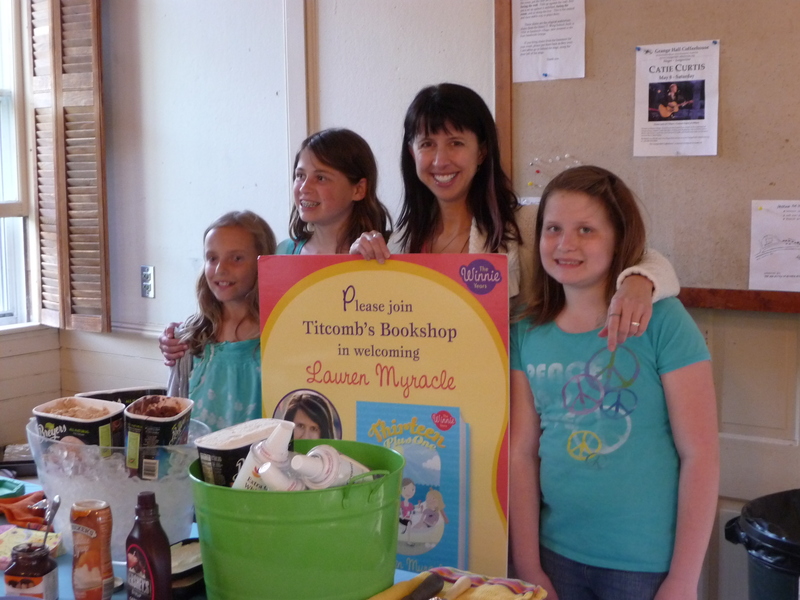 An author visit such as Lauren’s is such an opportunity for readers and to have the great spot on the Cape where Titcomb’s Bookshop seems to be a talisman for them is awesome. I have a short flipvid that I will try to get on this post…but I kind of screwed it up so only part of the interview with Lauren got taped…basically, I did a ‘word association’ interview with her and she was a good sport about it. So…words for now, more to come (I hope). It was not a bad night at all….9 poets, 16 poems and a little more, an audience, a camera, great judges, food and the Grange. Could we have used some more friends/poetry afficionandas/fansofpoets? Yes…because if you were not there (no blame, of course) you missed incredible live poetry by some amazing poets. The words I like to use after attending two sessions of live teen poetry (Poetry Slam at the CC Cultural Center and Poet Speak) are authentic and genuine. I’ll throw in fun, touching, clever, inventive, listenable, beautiful, thought-provoking, tear-inducing, humorous, searing, breath-catching, and maybe, just poetry to the ears and heart, too. Slam poetry is so not your usual on-the-page poetry. It is on the tip of your tongue, move the lips and into hearts of the listeners and the universe peotry. There are no parameters so to speak – no meter, no rhyme, no cadence – just a poet and their poem out loud. You get a feel for the person behind the poem. After all they are standing up there in whatever they feel like wearing and just handing out their self through poetry – their funny self, their deeply hurt self, their ‘there has to be some humor in this world somewhere’ self, their ‘I’m here now’ self….limitless possibilities. Can’t say enough good things about it. Be there next time. Talk to a poet (They walk the halls of YOUR high school & beyond) and talk to that inner poet, too. Bring ’em out one day for the next Poet Speak/Poet Slam. Thanks to the Friends of the Sandwich Public Library, Type Trends Printing – Hyannis, and Cape Cod Five Cents Savings Bank for sponsoring. Thank you to David Colantuono, photographer for the Broadsider, for the above photos and especially to: Niki Bousquet, Nicolette Bovat, Jaryd Mohre, Kevin Bradley, Emily Manning, Isle Bastille, Kathryn Anzola, Molly Marcotte, Madaline Lenahan and Greg Hischak, Guest Slam Poet.